I’ve noticed TYLT ENERGY 2K a USB wall charger with an internal 2,300 mAh battery, is currently on Kickstarter for $20, and received some press coverage. The main advantages of this system is that it saves space ,and you don’t need to remember charging your phone and your USB power bank separately, it will just charge both within 3 to 4 hours. However, since I’ve recently purchased a USB solar power bank with a 30,000 mAh battery (actual 8,000 to 10,000 mAh) for about $25, I thought there must be better options with a larger batter and similar price, or cheaper price with a similar battery size. It turns out there aren’t so many options, but I did find NewTrent Travelpak Plus with a 7,000 mAH battery that sells for about $40 on Amazon and even $19 on Ebay. But I’ve found a product even more original and versatile with E-link Technology’s iFans EL-PB-17 that can either be a simple USB wall charger, a standalone 3,000 mAh power bank, a USB wall charger with internal battery, or an SD card reader. Just like TYLT charger it has a US-type foldable plug, but you can also use the power bank directly, if you wish to charge it from your PC or laptop for example. If you combine the AC adapter with the 3,000 mAh, you can charge your phone / tablet and power bank in one go, and it’s small enough to carry easily. If you’re thinking it could do a neat ARM board / device UPS, it may not work as expected because there might be a delay while switching between AC power to battery (TBC). At least, this is the way TYLT charger works. I could not find this exact model for sale anywhere yet, but the 2-in-1 model (also called EL-PB-17? 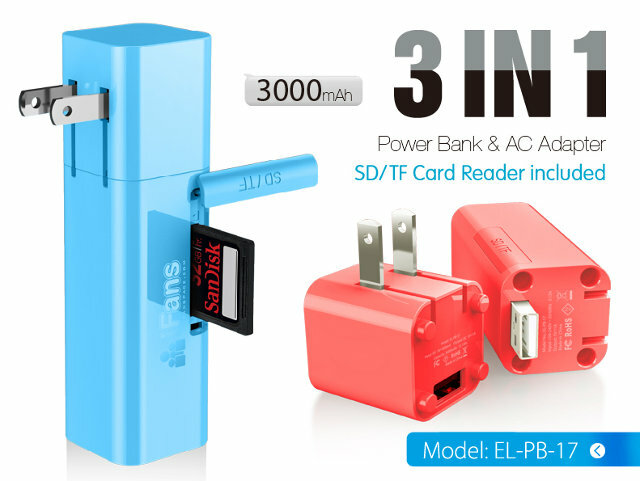 ), without an SD card reader, for $29.99 on Amazon or $36.99 on Aliexpress. It just has a full-size USB plug on the battery pack…? With a micro you could plug it into a lot of phones. With a socket, the adapter could be tiny. Seems like a bad design choice? Normally you’d use a USB to micro USB cable with power banks. It’s a bit more convenient than connecting it directly to the phone.